Police officers who were secretly filmed watching a pornographic video on duty could face disciplinary action. Leicestershire's Chief Constable Matt Baggott, who has watched a "rough cut" of the Channel Four documentary, has apologised for the behaviour. Reporter Nina Hobson, a former policewoman, went undercover at the force for a Dispatches programme. Mr Baggott said: "The footage contained examples of incidents ranging from poor behaviour to unacceptable attitudes." 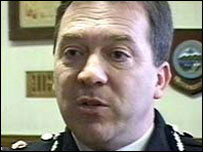 The chief constable added: "I apologise for the poor behaviour shown in the documentary. And we will accept criticism wherever it is justified. "I need to be clear that such attitudes and behaviours have no place in a modern professional police service. "They also do not represent what is the 'norm' in the Leicestershire Constabulary. "We will take firm but proportionate action to deal with issues raised." A force spokeswoman said this meant the officers involved could be disciplined. The film shows male officers watching a pornographic video late at night whilst on duty. Ms Hobson said her four-month investigation also exposed derelictions of duty, including officers on patrol playing "hide-and-seek" in their cars and fetching takeaways while pretending to be busy. Mr Baggott said he was disappointed the documentary portrayed "a very small group of targeted individuals" as being representative of his force. Ms Hobson, who is unemployed after leaving the force, has defended her decision to be a whistleblower. The 35-year-old mother-of-two, from Norfolk, first became a police officer in 1990. She left 11 years later before rejoining in March 2005. She would not reveal how much she was paid for her investigation, but admitted her foray into journalism had ended her police career. "I had a career in the police force and I became disillusioned, not with the officers necessarily but with the organisation," she said. Commenting on the actions of the officers watching the video she said: "I think it's absolutely disgusting." Dispatches: Undercover Copper will be broadcast on Channel 4 on Thursday at 2100 BST.